St Anthony (ca. 250-356 A.D.) is one of the great masters of the spiritual life of Eastern Christendom. He has been held in the highest esteem by Christians of the East from his own time down to the present. One of his eminent admirers was St Athanasius, who knew him personally and wrote a biography of him, which is one of the best sources of information we have about him. 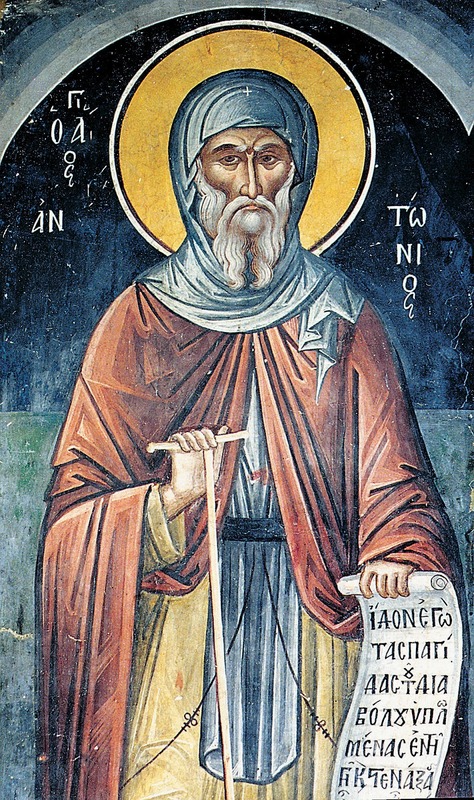 Two other outstanding admirers of this great saint are St Macarius, Metropolitan of Corinth (1731-1805) and St Nicodemus of the Holy Mountain (1748-1809). They have included at the beginning of the Philokalia, which was compiled and edited by them and published in 1782, a work containing many sayings and observations which have traditionally been attributed to St Anthony. Though he was unlettered, St Anthony became a man of remarkable spiritual wisdom and understanding, capable of teaching others by word of mouth concerning God's creation, Providence and Grace, concerning human nature and destiny, and the ways which lead man to self-perfection and salvation. Fragments of his teaching, including those contained in the work just mentioned, entitled Admonitions on the Character of Men and the Virtuous Life, have been recorded by others who had listened to him and were impressed by their value. Many remarkable ideas are contained in this collection of sayings. One of these ideas is that of the “rational man." A good deal is said on this subject, though not in the form of a separate unified section, but of scattered statements. Wishing to present St Anthony's teaching on this theme in as precise and meaningful form as possible, I have translated the relevant passages from the original Greek text contained in the Philokalia, brought them together, preserving however the sequence in which they appear in this work, and present them below, after some interpretative remarks. The rational man of St Anthony is not the learned man or scholar, is not the dialectician or speculative thinker. He is the God-centred man, the man who directs all his thought and aspiration towards God; who has resolutely turned away from the earthly and temporal towards the heavenly and eternal; who knows what is good and what is evil, and chooses and does what is good and avoids what is evil, or at least consciously strives to do so. He is a man who has radically changed his inner self. The rational faculty is, for St Anthony, the distinguishing attribute of man, is that which distinguishes man from the brutes and makes him akin to God and unites him with God. This faculty is conceived by him as being above all a power of apprehending values, of discriminating good from evil, of ordering one's whole life, inner and outer, with a view to acquiring or doing what is good and avoiding or overcoming what is evil, and of contemplating God. In other words, the function of reason that is considered important is not the speculative but the moral, not the discursive but the intuitive, the contemplative. This faculty is, according to our saint, present in the majority of men in a latent, inoperative state. As a moral, contemplative power, it is dead. Instead of being governed by reason, people are dominated by irrational desires; instead of being oriented, as they ought, towards the eternal and divine, they are absorbed in the temporal and material. Their souls are in a state of darkness, devoid of divine light. It follows that they are not, strictly speaking, men. Only the "rational man," whose rational faculty is in an active, operative state is, in the strict sense, a man. It is clear that the "rational man" of St Anthony is none other than St Paul's "new man," whose mind has been "renewed" (Rom. 12:2), that is, the Christian mystic, the saint, or one who is on the way to becoming such. To many non-Orthodox Christians, this teaching of St Anthony will appear strange, because Western Christianity has tended to banish reason from the spiritual life or at least to minimalize its role. On the other hand, Orthodox Christians, who are familiar with their long tradition, will find this teaching their own, traditional standpoint, expressed in a clear and emphatic manner. Men are improperly called rational; it is not those who have studied the sayings and books of the wise men of old who are rational, but those who have a rational soul and can discriminate what is good from what is evil, avoiding what is evil and harmful to the soul, but keeping carefully, through practice, what is good, and doing this with many thanks to God. These men alone truly deserve to be called rational. The man who is truly rational has only one serious concern, to obey and please God, the Creator of all things. And to this end alone he disciplines his soul, how to do what is acceptable to God, thanking Him for His so great and benevolent providence and government of all things, whatever it may happen to be in the case of his life. For it is absurd to thank physicians for giving us medicines which are bitter and unpleasant, for the sake of the health of our bodies, but to be ungrateful to God for things that appear to us harsh, and not to perceive that everything happens as it ought, and for our interest, and according to His providence. The rational man, examining himself, approves what is appropriate and useful to him, and distinguishes what is proper to the soul and beneficial to it from what is foreign to it. Thus he avoids what is harmful to the soul as foreign to it and separating him from immortality. He should be called a man who either is rational or is susceptible of being corrected. One who is incorrigible should be called non-human. The rational faculty, when it is truly present in us, makes us worthy of being named men. Lacking the rational faculty, we differ from irrational animals only in the form of our members and in the possession of speech. The truly rational and God-loving soul has a direct knowledge of all things in life; and it lovingly reconciles itself to God, and thanks Him with sincerity, having all its striving and mind directed towards Him. A truly rational and virtuous man is distinguished by his look, walk, voice, smile, manner of sending his time, the circumstances of his life. Everything in his soul has been thoroughly changed and corrected so as to become as beautiful as possible; for the God-loving mind of such persons, like a wide-awake doorkeeper, bars the entry to evil and ugly thoughts. The rational man strives to free himself from blind alleys, conceit, insolence, deceit, malice, greed, and the like - from everything that is a work of the demons and of an evil will. Now all things can be achieved through zeal and persistent striving, by a man whose desiring is not directed towards lower pleasures. Rational men have no need to pay attention to many conversations, but only to those which are profitable, which are guided by God's will; for thus men come back to life and eternal light. All rudeness should be avoided in conversations; for modesty and self-mastery assuredly characterize rational men even more than virgins; for the God-loving mind is a light which illumines the soul as the sun does the body. Man's rational faculty unites him with the ineffable divine power, while his bodily faculty makes him akin to the animals. Now few persons, those who are perfect men and rational, strive to keep their minds directed to Him Who is God and Savior, and to retain their kinship with Him. And this they show by their deeds and virtuous way of life. The majority of men, on the other hand, whose souls lack rationality, having abandoned that divine and immortal sonship, incline towards the dead, unfortunate, short-lived kinship with the body. Like irrational animals, minding the things of the body and inflamed by lusts, they separate themselves from God and drag the soul from heaven to the abyss of its (animal) desires. The rational man, taking to heart communion and union with God, will never direct his love to anything earthly or mean, but will keep his mind directed towards the heavenly and eternal. He knows that God's will, being the cause of all goods and the source of eternal blessings for men, is that man be saved. Those who dislike knowing what is beneficial and what has been well said are considered as being in a bad state. In the case of those, on the other hand, who, while knowing the truth, quarrel shamelessly, reason has become dead and their character bestialized; and they do not know God, nor is their soul illumined. Just as we have received the sense of sight from God in order that we may know phenomena, e.g. what white is and what black is, so also has the rational faculty been given us by God in order that we may distinguish the things that are good for the soul. But desire, divorced from reason, begets pleasure and does not allow the soul to be saved or to be united with God. To escape death is impossible. Knowing this, men who are truly rational and disciplined in the virtues and in God-loving thoughts, accept death without sighs, fear, and mourning, remembering the fact that it is inevitable and is a deliverance from the evils of life. A real man strives to be pious. Now one is pious who does not desire alien things. Alien things to man are all created things. Therefore, he despises them all, being an image of God. A man becomes an image of God when he orders his life rightly and agreeably to God; and this is impossible unless a man detaches himself from worldly things. Now he who has a God-loving mind knows well everything that is profitable to the soul and every act of piety which he should perform. All those souls which are not steered by the rational faculty and governed by the mind, so that it restrains and prevails over and governs their passions, i.e. pain and pleasure; - such souls perish like the irrational animals, carried away by the passions, like a charioteer by the horses. The rational man selects what is best and knows God, the Creator of all things. And he thanks Him and sings hymns of praise to Him, despises the body even before death, and does not allow evil sensations to be fulfilled, knowing their destructive action. A rational and God-loving man, remembering and reflecting on the evils (that befall impure souls) after death, lives piously, lest he be condemned of them and suffer them. Unbelievers, on the other hand, whose soul is devoid of rationality, live impiously, sinfully, disdaining the things that befall souls in the other world. He is a man who has understood what the body is, namely, corruptible and short-lived. Such a man understands, too, what the soul is, namely divine and immortal and, being a breath of God, has been joined to the body to be proved and deified. Now he who has rightly understood the soul orders his life in a manner pleasing to God, not yielding to the body. And seeing God with his mind, he also contemplates mentally the eternal goods which are granted to the soul by God. The rational soul, remaining immovable in its good resolutions, steers like horses the spirited and appetitive elements, its irrational parts. And having overcome and restrained them and become their master, it is crowned and deemed worthy of the heavenly life. It receives the prize for this victory and its painful efforts from God Who created it. The truly rational man, seeing the happiness of the wicked and the prosperity of the unworthy, is not disturbed by imagining the pleasures of such persons in this life, as irrational men are. For he knows clearly both the inconstancy of fortune, and the uncertainty and brevity of life, and the fact that Judgment is beyond bribery; and he believes that he is not being neglected by God as far as his really necessary nourishment is concerned. The rational man, despising material things and this brief life, chooses heavenly bliss and eternal life, which he receives from God through his virtuous mode of life. A paper first published by the Institute for Byzantine and Modern Greek Studies in 1956.